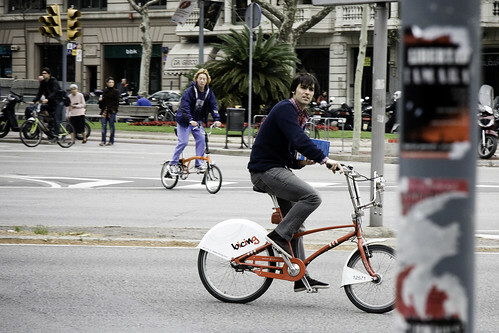 A quiet mobile bicycle moment in Barcelona. 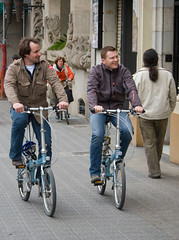 Hipster Extreme and a businessmen, both enjoying the ease of use of the bicycle in Barcelona. Checking casually for traffic on the left and enjoying the fine art of conversation on bicyles, on the left. Here's the bicycle I borrowed to ride around Barcelona on the first day I was, there, before travelling to Lleida for a bicycle conference. Perfect for drive-thru banking. I borrowed it from the chap on the right. 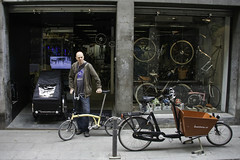 Koos, a Dutch guy who owns the Biketech bike shop in Gracia. Wonderful guy, cool shop. Here's a couple of guys heading in different directions and a couple, with a bicycle close at hand, having lunch on a bench. Lots of folding bikes. I've been thinking of them a lot lately. 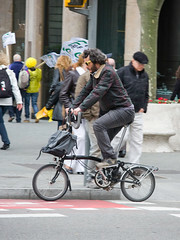 BCN is plenty of folding bikes, most of them are brompton. i think we've another point of view of that kind of bikes, for us are something useful and cool at the same time, so popular among the hispsters. Do you know a little bit about those wonderful small red bikes that is at most of the pictures? ?? I'm a little bit in love with them!! I love the look of Barcelona ! I can drive with using phone while in fast move. I had a cycle chic moment today when I experienced a flock of New Yorkers biking along with me on 6th Ave heading uptown. Gotham still too gritty for a leisurely speed though. New York may never be like Barcelona or Copenhagen in rhythm. This city's architecture is not as graceful as in Europe, and everyone is rushing and the cabs...oh mercy! Although, I notice when the ladies are clutching purses in their arms, and the gents in suits, motorists slow down and relish a sublime moment. 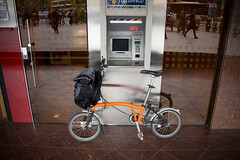 fasterfis: anon has the link to the barcelona bike share programme, bicing, just above. I also notice that this post answers the request in the previous one for more attractive men on bicycles. Though Mikael is really a bit young to be a "dirty old man". One could launch that accusation to Georges Moustaki in his recent - charming - song about "Une fille à bicyclette", though he dedicates it to Mayor Bertrand Delanoé, who would presumably be more interested in looking at un garçon à bicyclette. Oh, it is a sweet song, and not remotely lecherous. Nice how things work out. Would be nice if familicious could head down to Barça. Lagatta thinks its nice that here is proof that I don't have to be tall and blonde to be cycleicious.